Soru: This article appeared today at SpaceWeather.com talking about a rare occurrance of nacreous or mother-of-pearl clouds in Tierra del Fuego, Argentina. It goes on to explain how rare is it for them to occur in the southern hemisphere let alone so far from the South Pole. I couldn't help but notice that is occurred on the same day that a rare snow was recorded in southern Brazil as shared on the Wild Weather, the Wobble Effect part of this Ning. Is this related to the wobble's effects on the upper atmosphere? Is this perhaps part of the signs in the skies we were told to look out for as we get closer to the Shift? 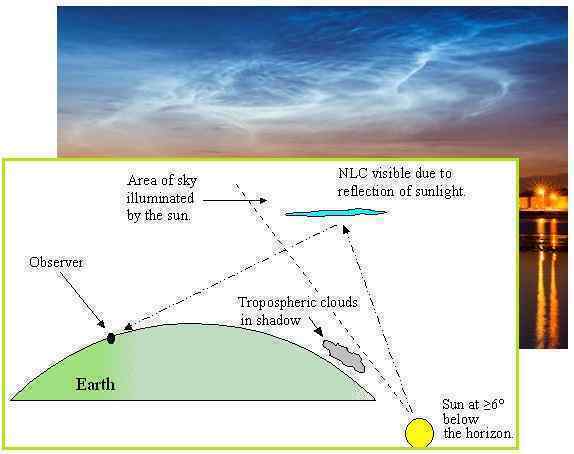 Is man correct in his understanding of what causes these clouds? http://spaceweather.com/ These clouds, also known as "mother of pearl clouds," form in the stratosphere far above the usual realm of weather. Atmospheric optics expert Les Cowley explains the special conditions required to create such a cloud: "Take an unusually cold lower stratosphere (15-25km high), use some gravity waves generated by high winds and storms in the troposphere to stir in some water vapour, and -- voilà! You get these clouds made of tiny ice crystals shining after sunset with unforgettably bright iridescent colors." [and from another] http://www.atoptics.co.uk/highsky/psc1.htm They form at temperatures of around minus 85ºC, colder than average lower stratophere temperatures, and are comprised of ice particles ~10µm across. The clouds must be composed of similar sized crystals to produce the characteristic bright iridescent colours by diffraction and interference. [and from another] http://www.atoptics.co.uk/highsky/hgrav.htm The waves occur between any stable layers of fluids of different density. When the fluid boundary is disturbed, buoyancy forces try to restore the equilibrium. The fluid returns to its original shape, overshoots and oscillations then set in which propagate as waves. Gravity or buoyancy is the restoring force hence the term - gravity waves.